Paypal to OrchardPups Please click link to send money safe with Paypal ~ thank you! These pups are not ready for adoption yet, but will be soon! 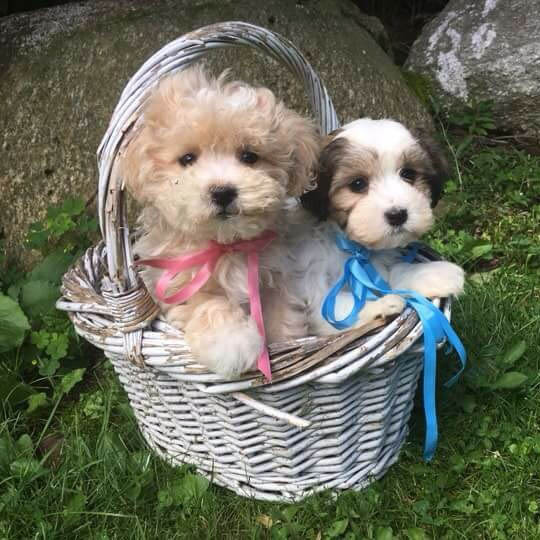 NY STATE TAX COLLECTED ON ALL SALES – ALL PUPPY WEIGHTS ARE APPROXIMATE AND THEIR FUTURE GROWTH OR LACK OF GROWTH CAN NO WAY BE GUARANTEED – UPON YOUR REQUEST I CAN PROVIDE PICTURES OF ALL PUPS MOTHER AND FATHER AND POSSIBLE OLDER SISTERS & BROTHERS! What does F1 Standard Mean? F1 Standard- this means 50% poodle and 50% Golden Retriever (sometimes a is used English golden retriever) expected adult weights 45 lbs and up. Very light shedding, straight to some wavy coat. Sometimes a nice big XL pup is born – they can grow to 90 lbs and up, they usually reserve fast. Super sweet big babies! What does F1b Standard Mean? F1b Standard- in our case it’s a Goldendoodle mother bred to a standard poodle. Expected adult weight 45 lbs and up. Very popular for families with allergies . No noticeable shedding . Fuller wavy coat and loose waves. What is a Parti Factor? What is an F2 Goldendoodle? 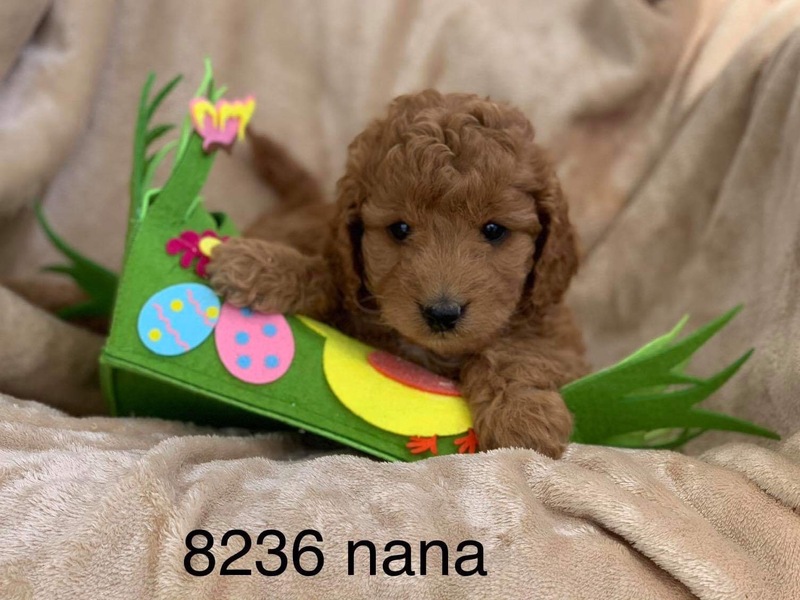 F2 Goldendoodles – in a nutshell, a Goldendoodle bred to a Goldendoodle . Nice wavy , curly coat, extremely low shedding. 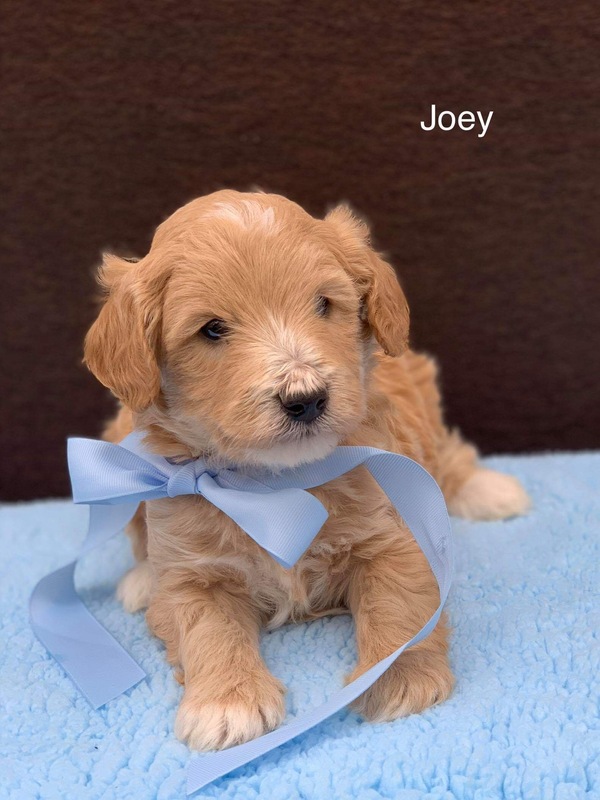 F2b Goldendoodle – is a Goldendoodle bred to and f1b creating 62.5 %poodle and 37.5% retriever. Pretty waves, extreme low shedding . 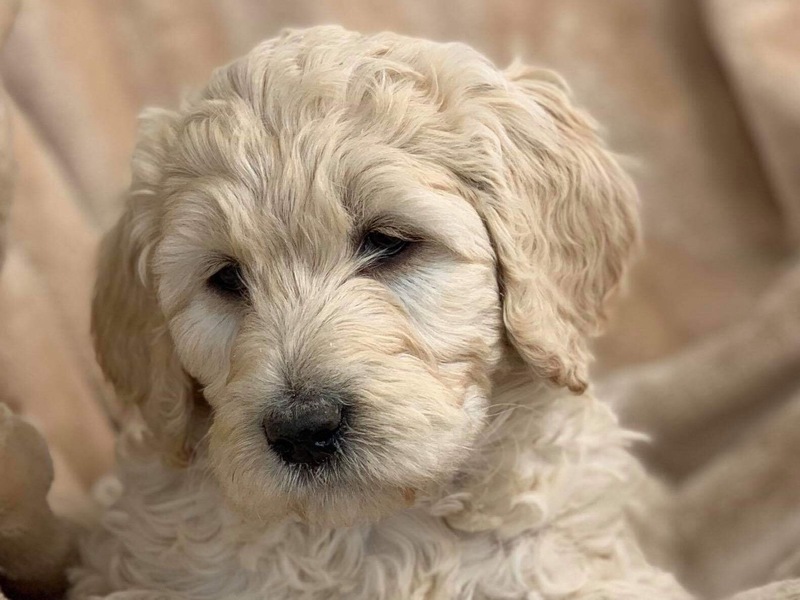 What is an English Goldendoodle? 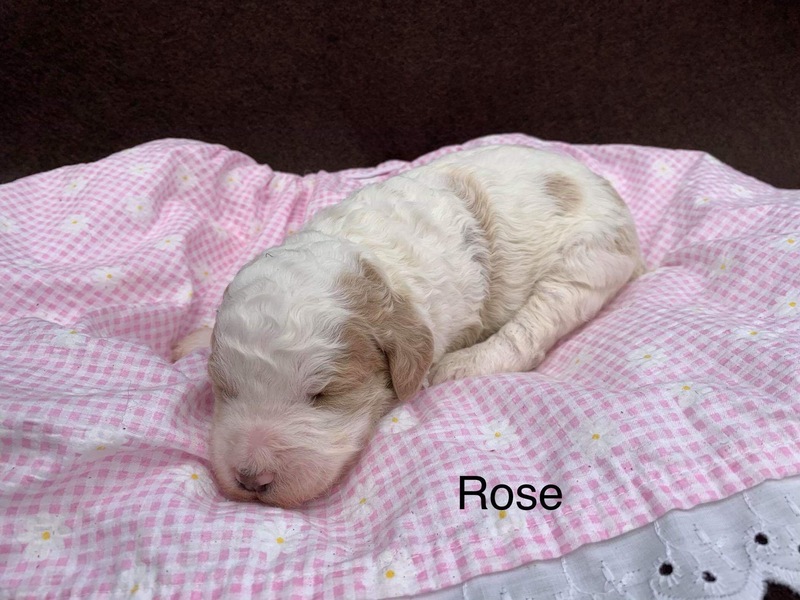 English Golden Doodles- have nice dark eyes and white to light cream coats. They have a very pretty blocky built that is pleasing to the eye. They are a nice medium size puppy. What is a Mini Goldendoodle? 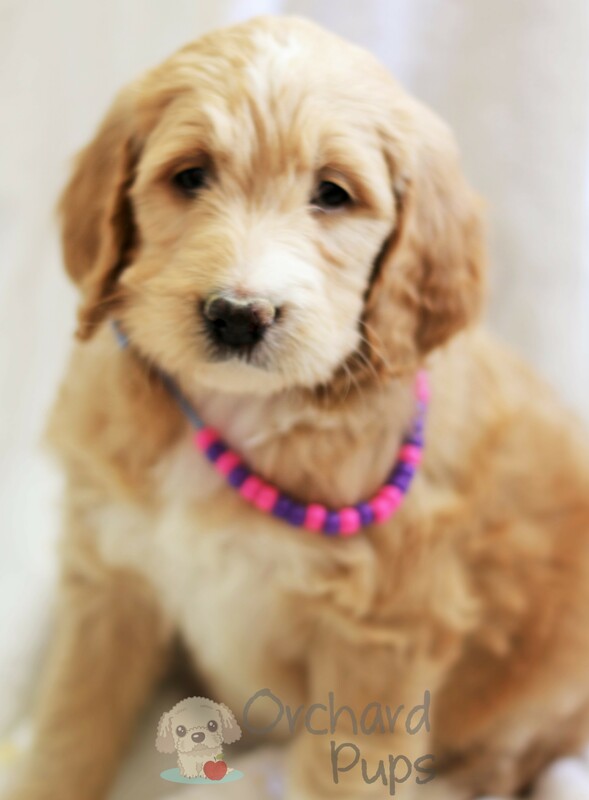 Mini Golden Doodle is a Retriever bred to a Toy, mini or smaller poodle, weights of the parents will be available. What is a Petite Goldendoodle? 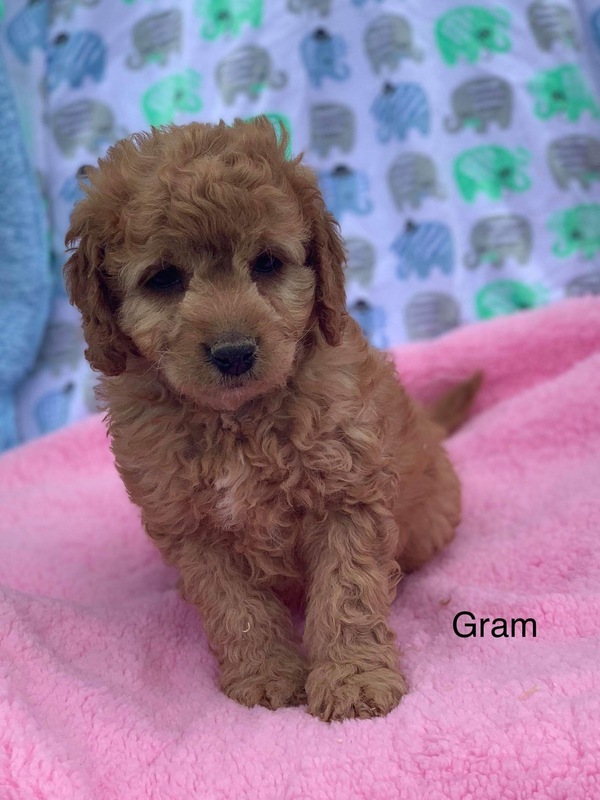 Petite Golden doodle- is new to us. These are bred to produce a more manageable size, but not a mini. The mix is the puppies are ½ Poodle, ¼ Golden Retriever and ¼ Cocker. The colors should be exciting, and this program grows we will be sure to post updates. A first litter is planned for early spring 2015. 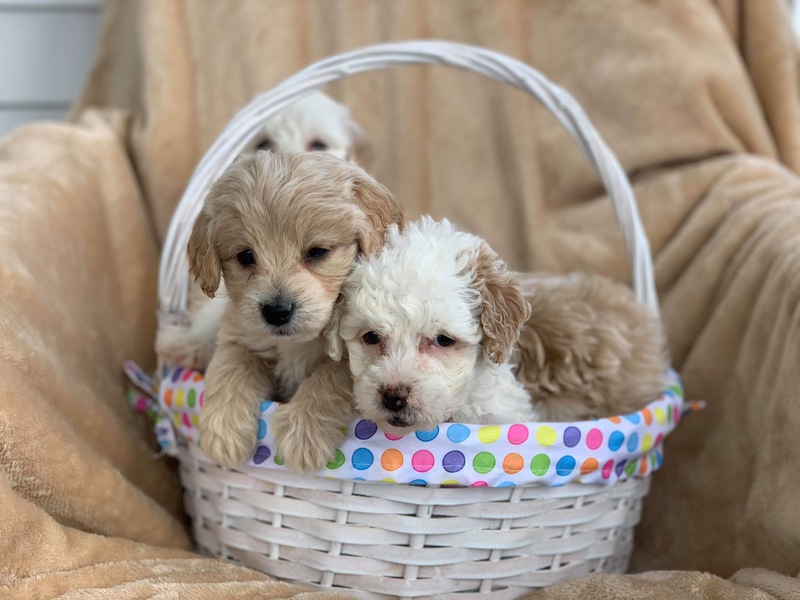 Orchard Pups is not responsible for any cost due to Hypoglycemia in your puppy after you leave the Orchard ~ Please read and ask questions to us or your Vet. Hypoglycemia, or low blood sugar, can quickly become an urgent health problem in toy and small-breed dogs, say experts. Without intervention, there is risk of dogs slipping into a coma and possibly dying. Juvenile hypoglycemia, which is seen in puppies less than 3 months of age, generally occurs because puppies have not fully developed the ability to regulate blood glucose concentration and have a high requirement for glucose. “In a nutshell, the brain can only use glucose for energy,” explains Margret Casal, D.V.M., Ph.D., assistant professor of medical genetics at the University of Pennsylvania School of Veterinary Medicine. “If glucose levels drop in the blood, then there is less energy for the brain, which causes neurological signs such as disorientation, tremors and coma. “Normally, glucose is stored in the form of glycogen in the body, and when necessary, hormones stimulate the breakdown of glycogen to supply the brain and other tissues with fuel,” she continues. 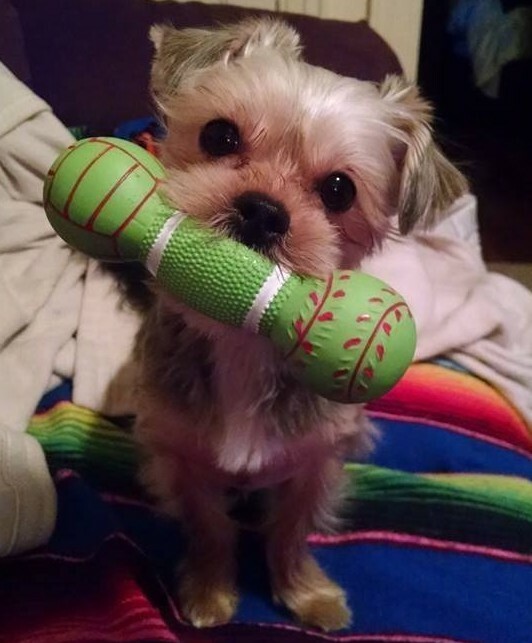 “Sometimes in toy and small breeds, the process does not occur quickly enough and hypoglycemia begins to kick in. Among the signs of hypoglycemia are loss of appetite, extreme lethargy, lack of coordination, trembling, muscle twitching, weakness, seizures, and discoloration of skin and gums. “They usually act like they are drunk,” says Amirov. “They may be lethargic, shivering or refusing to get up and play. Most won’t eat or drink. If you know your puppies well and they are acting out of the ordinary, there’s a very good chance they are going into low sugar shock. A simple case of hypoglycemia is often due to overactivity combined with too much time between meals. Experts recommend rubbing syrup on a dog’s gums, dabbing sugar water on or under the tongue, or giving a concentrated solution of glucose to offset the drop in blood glucose. Providing a simple sugar solution and hydrating liquid are key. “It also is imperative to keep them warm,” Smolarz says. “I put a kitchen towel in the microwave for 30 seconds. I shake it out and wrap the puppy in it to bring up his body temperature. Low blood sugar can cause hypo­thermia, so I get them warm first. Measures to prevent hypoglycemia include feeding puppies and small dogs three or four times a day. A high-quality, nutritious dog food is important in helping to sustain a dog. Owners also should provide a warm environment. Pugs have been born! The Wait List for AKC Pugs is now open for 5 girls and 3 boys! The many looks of a poodle…these are all the same Poodle!